Despite the bitter breeze and colder climates, there’s one thing that we all secretly look forward to year after year as Autumn makes an appearance… with those chilly evenings making themselves known, it gives us the perfect excuse to barricade ourselves in blankets, and curl up by the television watching our favourite TV shows. October 14th sees the return of E4 show, Made In Chelsea, and who better to take a little fashion inspiration from this season? However, being a student on a budget as opposed to a Chelsea girl can make it hard to keep up with the latest trends. So, I’ve scoured the high street and raided the web to find four on-trend winter coats that don’t break the bank, whilst mirroring some of the girls’ most classic autumn looks. Trend one: The leather biker jacket. Regularly sported by fashion blogger, Rosie Fortescue, the leather jacket is a versatile piece ready to transition you from autumn to winter without requiring you to pile on the layers. Rosie pairs her jacket with contrasting colours, however the leather would be perfect for adding an edge to those pastel colours we saw frequently throughout London Fashion Week 2013. 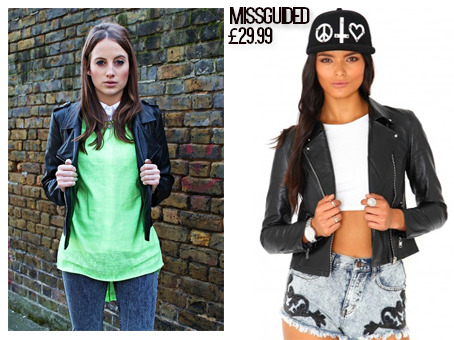 I found a similar leather-look jacket on Missguided.co.uk, for just £29.99. Perfect to throw on in the daytime, this jacket can also be paired with a dress on a night out, to keep you looking cool but feeling warm. From hats to scarves to coats; it’s safe to say that fur was a staple piece in Binky Felstead’s wardrobe in previous seasons of MIC. A trend that is definitely more attributed towards the chilly winter months, fur is the ultimate wardrobe piece to keep you cosy this season. 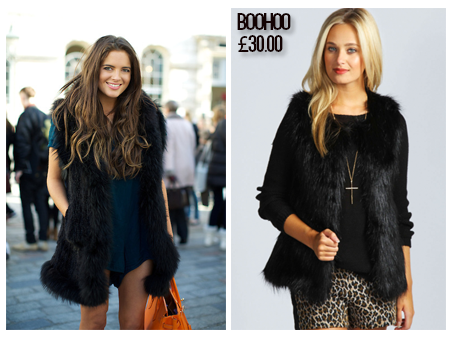 However, we students can’t afford the real thing, so Boohoo.com offers a faux fur option that won’t set you back too much, at £30.00. As seen on newlywed Millie Mackintosh, the trench-coat has made a return but with a slight difference. If you’re not after the traditional “detective” look, this season’s trench-coat may be better suited to you. This piece as seen on Millie has more of modern twist with contrasted leather sleeves and a khaki body. I found a similar match on Missguided.co.uk for £58.99, which also carries the same item in several different colours. This coat is perfect for keeping dry in this unpredictable weather, while looking effortlessly glamorous with a waist belt to cinch you in, in all the right places. 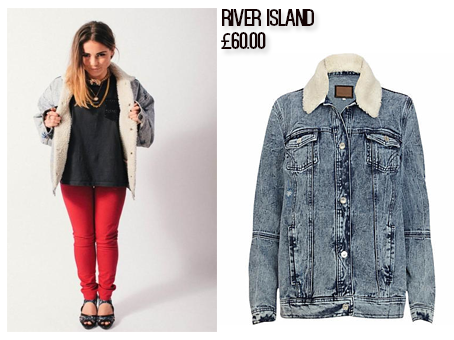 Being petite, Louise Thompson tends to go for smaller jackets to elongate her body. In this photo, she can be seen wearing an acid wash denim jacket with wool lining. While denim jackets are an all-season staple, the wool adds detail and warmth to carry you throughout winter. I’ve found a match at River Island for £60.00, which also carries a similar jacket in different shades of denim, making it easier to find your perfect match. With the television programme making a return to our screens, we will keep an eye out as they work these pieces into their wardrobes. Whether you’re a Louise, Rosie, Millie or Binky kind of girl, there’s a winter jacket out there for everyone. So, whether you’re living in student halls or SW3, let it be known that there is an alternative way to achieve these looks without dipping too much into that overdraft.